The ease of installing sauna steam kits has made this luxury amenity a popular addition to many homes. 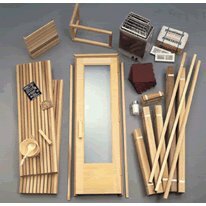 If you purchase a “pre-cut” kit, you’ll get all the parts and wood for the sauna but still need to put it together. 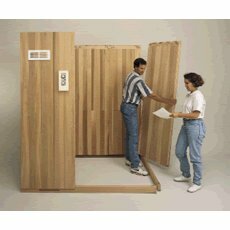 First, you must frame and insulate the space yourself before you can install these types of sauna steam kits. The kit comes with pre-cut tongue and groove boards which you nail to your frame’s studs. The boards fit the exact measurements you give to the company if it’s a custom kit, so if you have an odd space that won’t quite fit the size of one of the standard steam kits, they can customize a sauna kit for you in a variety of symmetrical designs such as square, rectangle, hexagon or octagon. The second option is to build your frame to fit a certain size of pre-cut steam sauna kit. Here’s an example; in the Finlandia Precut Sauna the dimensions might be something like 5’ x 7’ or 8’ x 9’. Your job will be to follow the easy instructions to nail the panels to your frame, then hang the glass door and assembled benches (again, everything in this sauna kit is pre-built), install the trim and baseboard, and plug in the heater which is included along with a heater guard and the volcanic rocks for your steam sauna. But the sauna steam kits even go beyond the basics to include other necessary parts such as: flooring, vents, and light fixtures. Also, you don’t have to do additional shopping with another dealer; Finlandia will also include accessories such as a bucket and ladle, wall sign and thermometer at no extra cost. The paneling is horizontal (unless you specify that you need vertical when ordering the sauna kit), and made of excellent softwoods for steam saunas: red cedar is the standard although you can opt to get clear V.G. redwood, Alaskan yellow cedar, or clear Western Hemlock fir. The planning and installing of a sauna kit can cause some panic in homeowners who aren’t familiar with general carpentry skills or have no prior knowledge about how a steam sauna is built. If you’re not particularly handy with a hammer, you should consider getting a pre-fab steam sauna kit, or a portable design, rather than building a pre-cut or custom sauna. If you go the modular route, you won’t need to know how to build a thing, you just need to plug it in. Find Popular Finlandia Pre-Built Sauna Kits On Sale Now! The instructions that come with these steam sauna kits make it easy for anyone to have a home sauna. Even if you need a bit of help from a friend who can build the frame for you, or need to hire a handyman for a one-day job, you’ll find it’s worth the trouble to install one of these inexpensive, easy-to-assemble sauna steam kits.